Over 40 AWC-SB members, newcomers and local influencers filled the workzones presentation room Wednesday, November 2 for the anticipated “Becoming an Influencer” expert panel. The crowd appeared enthusiastic to hear the influential stories of our powerhouse panelists, Jenny Schatzle, Fitness/Nutrition expert, Life Motivator, and creator of The Jenny Schatzle Program; Hollye Jacobs, New York Times Bestselling author/speaker and creator of The Silver Pen; and Talina Hermann, Creative Director and mastermind of the Talina Hermann clothing brand. So, what makes someone an influencer? What journey do these types of individuals go on to become famous online and offline? Many of us think luck makes legends overnight sensations. In reality these women worked tirelessly for years on their image, shaping their goals over the course of many experiences which amounted to who they are today. 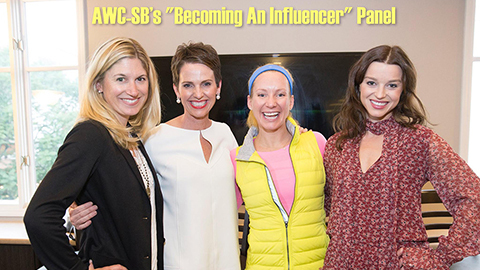 I’m excited to share with you the steps they took to become influencers in their field. AWC-SB Board Member and Senior Editor of Santa Barbara Magazine, Jennifer Blaise Kramer moderated the event. “What got you started? How did your following begin and on what social media platforms?” Jennifer asked of the panelists. To this first question a theme of organic authenticity emerged. Jenny, Hollye, and Talina admitted they’d never paid for formal advertising, followers, endorsements, etc. In their own genuine way, each discovered the power of Facebook, blogging, and photos (each worth a thousand words) to showcase their talents, raise havoc, and bring new wisdom to their unique fields. Jenny used Facebook first to share her fitness and nutrition advice as well as to publicize her exclusive workout classes, originally hosted at neighborhood parks in Santa Barbara for only $5! Fresh out of fashion school, Talina spread selfies across various social media platforms before selfies became a thing. Hollye found blogging her best soapbox where she shared her transition from bedside nurse to in-bed patient. Respectively, their guidance related to fitness/nutrition, fashion, and battling breast cancer, grew viral from their truly grassroots approaches. All panelists agreed, despite some hesitancies, that social media is here to stay. You can use these platforms for good if you remain playful, authentic, and do it your own way. They felt the true test of their influence became evident when their followers engaged with them on social media. Their unique stories got their fans through their own struggles, and shed light on their lives in a powerful way. Each of the panelists expressed that they felt like they woke up one morning to realize they truly helped others through the lenses of their journeys. No one else did what they did . These bona fide women putting their stories out in the open for all to see led to Jenny owning a gym and getting a smoothie named after her at Whole Foods, to Hollye writing the ultimate “Girlfiend’s Guide to Battling Breast Cancer” (as she refers to it), and to Talina’s collaborations with brands and stores around the world. Although money didn’t spearhead their experiences, by sheer organic authenticity endorsements found their way overtime to each woman. Jenny told stories of how her following has helped her find quality products, like Hoka shoes. She stands behind these products on her mission to transform individuals’ bodies. Her best advice for fellow influencers, “K.I.S.S., ‘Keep it simple stupid.’” She feels she has her team to thank for keeping her in check of not becoming overwhelmed by social media. Every time Jenny goes to post she reminds herself of this message to ensure her message is coming across simply, clearly, and powerfully. Hollye’s blog, The Silver Pen, struck her followers heart strings. As a result the blog caught fire that spread to speaking engagements, her book deal, other writing positions, and more. She suggests to all, “Think twice, before you post or act once.” Hollye feels there’s no real reason to follow the “should and should nots” in life, but that taking a minute before acting or posting is the best way to safeguard your credibility as an influencer online and offline. While Talina didn’t frame her brand to feature others’ designs, she adapted to staying beautiful in her own right online by remaining the only orchestrator of her social media content. She only outsourced for data such as Google Adwords and others’ inspiration boards. Talina is happy to say she feels as if, “We ate it [social media] all up like candy, and got sick of it.” The days of posting every little thing about our lives became uncool. She hopes people will now focus on only posting those inspirations which add beauty to the world’s improvement. Talina Reminded us to meditate daily (even if for only a few minutes), The panelists’ stories of influence gave attendees three examples of the kindness, beauty, and authenticity we can all spread if we choose to use this power for good. AWC-SB is pleased that workzones graciously hosted this thrilling event and grateful C’est Cheese supplied local cheese, meats and treats. We’re glad we could share an evening with all of you and provide a small bit of thanks for all of your thoughtful discussions with AWC-SB…until next time! This entry was posted in Featured, Past Events, Podcasts on November 16, 2016 by Lisa.